The hype-fog surrounding the blockchain and its offspring cryptocurrencies is peaking, and this webinar slices through it. Is the blockchain revolutionary in scope? Absolutely will it all play out in line with the investment dollars? Not at all. Squaring the Blockchain Circle critiques the blockchain ecosystem. ICOs have resulted in some twenty billion dollars flowing into projects even as bubble indicators flash red. Bitcoin has the Midas touch. But there’s manifest blindness elsewhere, and Kunal decimates most half-baked, misconceived blockchain applications attracting funding. The webinar highlights that very few tokens which will deliver lasting value as the next Google or Amazon, and there will be a crash before things normalise. As the co-founder and CEO of uTrade and Hashcove, Kunal has been a part of the euphoria surrounding this technology, as well as a student of its superb prowess. Disclaimer: Views are of the speaker and not elearnmarkets.com. Divided into three parts- Part I, it discusses the origin of the blockchain culminating in the ICO boom. Part II discusses four specific aspects — decentralisation, trust and truth, security and scalability. Part III exposes the fallacy of viewing every database as a nail for the blockchain hammer, debates the value embedded in tokens, their mispricing and susceptibility to fraud and finally highlights the blockchain as futuristic technology. Kunal is the Founder and CEO of uTrade Solutions, an India based Fintech product firm which offers trading and risk platforms in 10 countries with global access. He has also co-founded a startups investing network called Chandigarh Angels Network. He has also cofounded Hashcove in the UK, a blockchain solutions company. Previous Kunal has worked in Algorithmic trading at Lehman Brothers & Nomura in London. Kunal holds a Computer Science Engineering degree from PEC, Chandigarh, India, and an MBA from Essex, Paris, France. 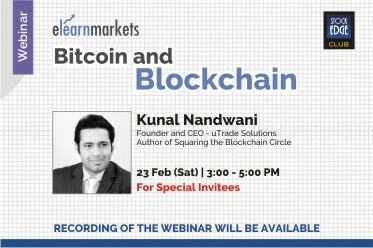 Kunal has recently written and published a book on Blockchain called "Squaring the Blockchain Circle"